Teaching Blog Round Up: Summer Math Fun and Freebies! Are you teaching summer school this year? Maybe you're tutoring, or work in a year-round school, or are just looking for ways to keep your own children's math skills sharp this summer. Whatever the case, we all know that the allure of summer fun is hard to beat ... pool noodles and popsicles pretty much always trump plus signs and perimeter! So, as they say, if you can't beat 'em ... well, you know what you've got to do! Many of the easiest and most successful summer math lessons come while moving around in the great outdoors... getting wet, keeping cool, and having fun! Here's one of my favorite kids (okay, I admit it - it's one of our grandsons) in an unplanned mini-lesson on subitizing and addition. All it took was a warm day. a bucket of water, and a piece of a kitchen sponge! I've been poring over the Pinterest boards, looking for fun summer math ideas to share with you! Allison at No Time for Flashcards has put together a great set of ideas, including math learning with sidewalk chalk, hoses, nerf guns, and water balloons. Here are some great ideas for measuring from Mother Natured, using rulers, kitchen scales, and a measuring tape. This post from Buggy and Buddy includes some great geometry ideas, plus a free shape hunt printable! Of course, when you're teaching summer school you may not have total flexibility for teaching every lesson ouside! So, here are a few summer-themed printable freebies I think you'll like to use on those too hot or too rainy days! From Leah Popinski at TpT, here's a fun set for non-standard measurement - using bees and caterpillars! From Donna at Math Coach's Corner, here's Beach Ball Shake and Spill, an easy-to-differentiate game. In her post, Donna explains some simple ways to use this game successfully in kindergarten on up through second grade! Popsicle Pizzazz from Nancy VandenBerge at First Grade Windows on Wonder has both math and literacy activities. As she always does, Nancy has included some terrific activities in this not-to-be-missed free unit! Last in the collection of summer freebies is this one from ... me! 120 summer-themed addition fact cards, and a solve-and-sort game to play with them! 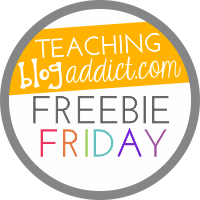 Download this freebie at my Educents store! Thanks for stopping by TBR! Please visit my blog at Primary Inspiration!